Laetiporus is a genus of edible polypores growing throughout much of the world. 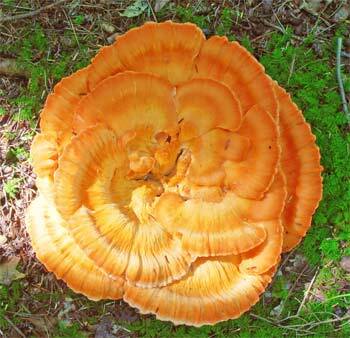 Also known as the sulfur shelf, chicken of the woods, the chicken mushroom, and the chicken fungus. It is, as one might expect, an edible mushroom with a taste quite similar to lemony chicken. The mushroom grows in large brackets - some have been found that weigh over 100 pounds (45 kg). It is most commonly found on wounds of trees, mostly oak, though it is also frequently found on yew, cherry wood, sweet chestnut and willow. The "Chicken of the Woods" is a popular edible, and easily recognized by its color, soft texture, and absence of gills. 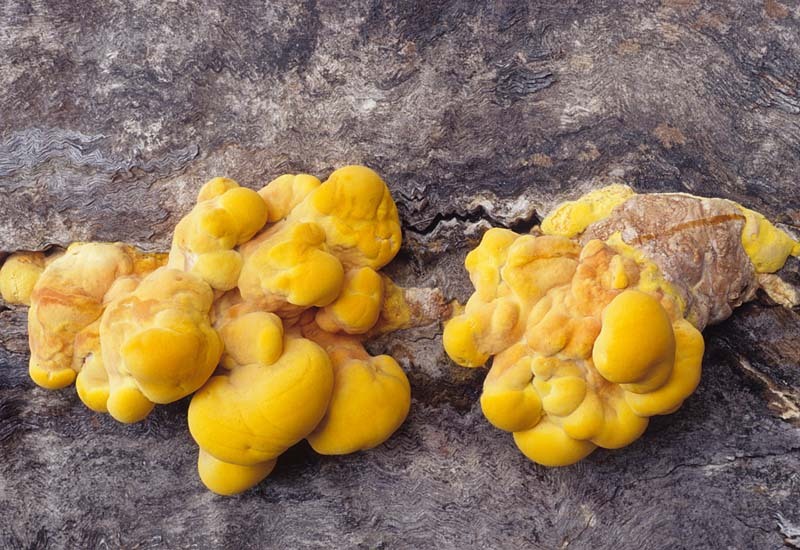 Though the Chicken of the Woods is a safe and easily recognized edible mushroom, it should not be eaten raw; there are reports of people being adversely affected when the mushroom was not cooked. Growing alone or, more typically, in large clusters on decaying logs and stumps of hardwoods and conifers; summer and fall, rarely in winter and spring; widely distributed as a species cluster. Distribution: America and Europe. Season late spring to autumn, annual. Bracket 10-40 cm across, fan-shaped or irregularly semicircular, thick and fleshy, usually in large tiered groups; upper surface uneven, lumpy, and wrinkled, suede-like, lemon-yellow or yellow-orange drying pallid or straw-coloured; margin obtuse. Flesh at first succulent and exuding a yellowish juice when squeezed, but white and crumbly with age. Taste pleasant and slightly sourish, smell strong and fungusy. Tubes 1.5-3mm long, sulphur-yellow. Pores 1-3 per mm, circular or ovoid, sulphur-yellow. Spores white, ellipsoid to broadly ovate, 5-7 x 3.5-4.5 μm. Hyphal structure dimitic with generative and binding hyphae; generative hyphae without clamp-connections. Habitat deciduous trees, usually oak but common also on yew, cherry, sweet chestnut and willow. Habitat: Late summer to early fall on logs and stumps of hardwoods. It is particularly common on species of Eucalyptus. Edible with caution. 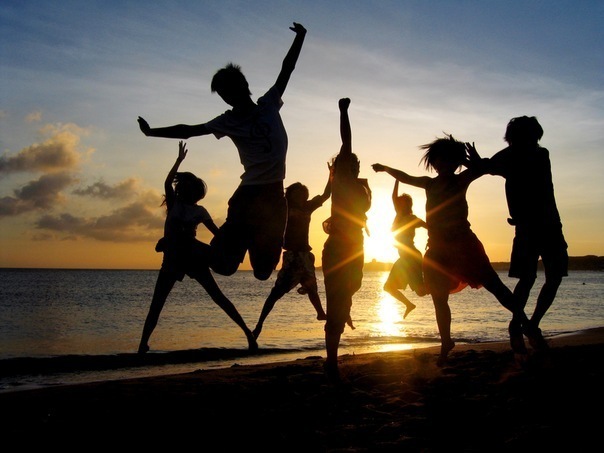 Prized by many, this species is also known to cause gastrointestinal upsets. Controversy exists whether the upsets are caused by old specimens, improperly cooked specimens, specimens growing on certain trees (Eucalyptus has be mentioned as a suspect host), or some other cause. If you decide to try it, eat only the young, fresh, growing margins, in small quantities, and cook it thoroughly. Sporocarp: Fruiting body annual; sessile to substipitate, consisting of overlapping, rounded fleshy shelves, 7-55 cm broad, upper surface smooth to roughened, yellow with reddish-orange to orange bands, margin yellow, irregular; flesh 2-3 cm thick, white to yellow; lower surface finely pored, bright yellow; in age fruiting body becoming dry, white and crumbly. Spores 5-7 x 4.0-5.0 μm, oval, smooth. Spore print white. Laetiporus cincinnatus has a white, rather than yellow, pore surface. Like Laetiporus sulphureus, it prefers hardwoods, especially oak, and is found east of the Rocky Mountains. Laetiporus cincinnatus fruits from the roots of trees (thus often appearing terrestrial), which helps to separate it from Laetiporus sulphureus, which typically fruits on logs or well above the ground on stumps and trees. Growing from the roots of hardwoods (nearly exclusively oak) near the bases of trees, thus sometimes appearing terrestrial; in clusters of rosettes; summer and fall, rarely in winter and spring; east of the Rocky Mountains. Fruiting Body: 5-60 cm broad, up to 4 cm thick; fan-shaped to obtusely semicircular; smooth to wrinkled; suedelike; bright to pale orange, often with vague concentric bands of alternating shades of color; frequently fading in maturity and with direct sunlight. Pore Surface: Tightly packed and nearly invisible when young; white. Flesh: Thick; soft and watery when young, becoming tough, eventually crumbling away; white. Spore Print: White. Spores 5-7 x 3.5-5 μm; smooth; broadly elliptical to round.